Now that the Windows 8 RTM version is available to MSDN Subscribers (and a 90-day trial version is available for non-subscribers), it’s a good time to update your app to the RTM version of Visual Studio 2012. Updating to RTM is required to submit an app for the Windows Store, and it’s a pretty painless process. In this, the third, post in my series “Windows 8: What I’ve learned,” I’ll share how the behavior of script loading and unloading in some Windows 8 Metro app templates require a different approach to using setTimeout for timers. I recently had the opportunity to spend some more quality time with the Visual Studio 2012 release candidate, building a Windows 8 app for some of my teammates who focus on Windows Azure, Brian Hitney, Peter Laudati, and Jim O’Neil. You can see a screenshot of the app to the left. 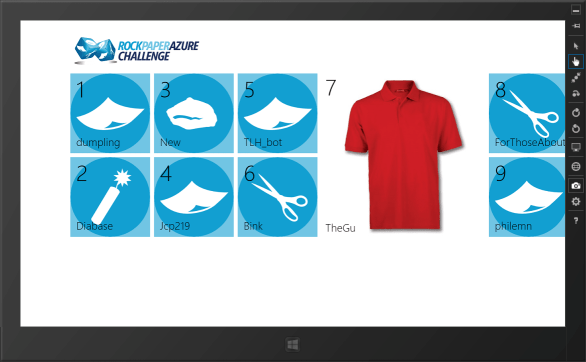 One of the really cool things that these guys have built on top of Windows Azure is the Rock Paper Azure Challenge, an contest to see who can code the most effective online bot to play the game Rock, Paper, Scissors in the cloud. Cool prizes are available, from Best Buy gift cards, to Windows Phones to XBOXes and Kinects. 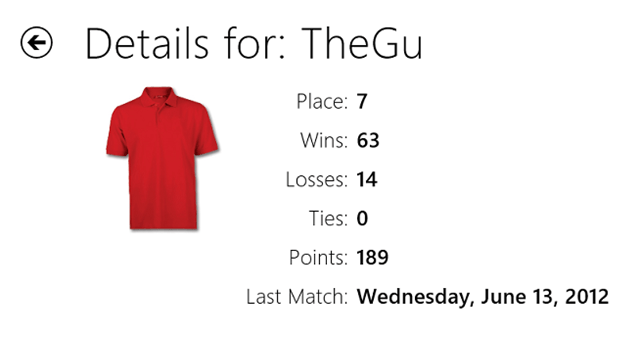 For TechEd North America this week, they came up with a very special contest, called Beat The Gu. The idea is simple…Scott Guthrie (whom most of you probably know now runs the Azure team), has a RockPaperAzure bot, and TechEd attendees could compete to see who could beat his bot (with a top prize of a 60″ LCD TV). I’ll be sharing more details on the app and what went into it in a future post, but for now I want to focus on one of the things that bit me during the development process, namely using setTimeout to create a timer. For the Rock Paper Azure Leaderboard app, I used the Navigation app template, which consists of a default.html page containing a div that becomes an instance of the PageControlNavigator class, which is defined in a script file called navigation.js. Basically this control provides an easy way to dynamically load fragments of markup, CSS and script referred to as Page controls at runtime. And the way that script resources are loaded and unloaded is a little different when using this template, as we’ll see in a bit. You can read more about how single-page navigation works here. Essentially, the code above will call a function named dataUpdateLoop after 30 seconds. This works great…as long as you stay on the home page. 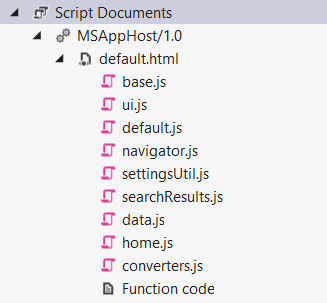 In an app based on the Navigation template, script loading is a little different. When I run the app, all of the scripts and such required to display the homepage are loaded, as shown in the Solution Explorer screen capture to the left. 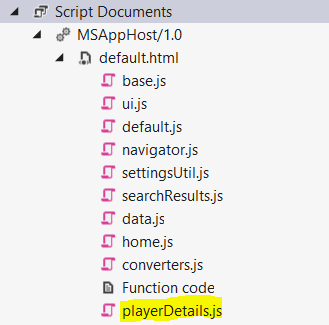 The base.js and ui.js files are part of the WinJS library, and will always be loaded in a Metro style app (they’re referenced in default.html). default.js and navigator.js are loaded by default.html, and provide support functionality for the entire app, since default.html acts as a parent container for the whole app. settingsUtil.js and searchResults.js are also loaded by default.html, and support the Settings pane and Search contract, respectively. Suffice it to say, this was not an acceptable result. I still needed to update the leaderboard on a regular basis, but having the app throw exceptions or crash if I tried to look at the details or use other functionality in the app was not OK. In the bold section of the code above, I’m testing whether I’ve captured an ID from a call to setTimeout, and if so, I’m calling clearTimeout and passing in the relevant timer ID. That’s all there is to it! Note that this tip also applies to the Grid App and Split App templates, since they use the same single-page navigation pattern using navigator.js. I hope you found this tip useful…if so, please share with your friends and colleagues! Once I had my template declared (note the data-win-control attribute that tells WinJS to instantiate this as a BindingTemplate), I had to tell my ListView about it, which I could do either programmatically or declaratively. The “select” will walk the DOM to resolve the reference, while the direct id reference in the first example won’t work because the fragment markup hasn’t been added to the DOM by the time that the resolution takes place. So if you’re working with ItemTemplates declaratively in page fragments, be sure to use the “select(‘#templateId’)” syntax to associate your template with your ListView. For the RTM release, you can use “Turn Windows Features On or Off” in settings (just open the Search charm for settings (Win+W), and type “Turn Windows”, and you should see it at the top of the second column). Once you’ve got that dialog up, the first option available will be “.NET Framework 3.5 (includes .NET 2.0 and 3.0)”. Check the checkbox, click OK, and you should be all set. Today, I’m kicking off a new blog series, which I’m calling Windows 8: What I’ve Learned, or W8WIL for short. I’ve had the good fortune of spending some quality time with the Windows 8 Consumer Preview release, and there are plenty of little things that can make your life easier as a developer, and I’ll share those in this series. You can teach people a lot by writing about best practices. But sometimes, you can also teach by illustrating your own boneheaded moves that tripped you up. In other words, don’t do what I did. Case in point is a recent issue I ran into when attempting to demo some HTML5 and JS code at last week’s CMAP main meeting. I had built a simple HTML5 site for consuming event data and the twitter stream for Community Megaphone. The twitter feed was working fine, but the event data, which was being populated dynamically from the Community Megaphone WCF Data Service via a call to jQuery‘s .ajax function, wasn’t working at all. Unfortunately, I discovered this only a few minutes before the start of the meeting. The site had worked fine the last time I demoed it, so I hadn’t felt a strong need to test it again. Oops! While I was trying to troubleshoot before the meeting got started, I got as far as discovering that the data service was throwing a 500 error, but wasn’t able to dig in further until I had a bit more time the following day. Those of you who have worked with WCF Data Services are probably nodding your head in recognition. One of the choices that the data services team made to enhance security is to provide very little information when things go wrong. That’s great for security because one of the main ways that the bad guys figure out how to exploit systems is by attempting to make them fail, and gleaning information from error messages returned. Unfortunately, what’s great for security is lousy for troubleshooting, particularly if you don’t have immediate access to the source for the failing service. <message>An error occurred while reading from the store provider's data reader. I’ve omitted some of the stack trace info to keep it a bit more brief, but the key bit is the type of the outer exception (EntityCommandExecutionException) and the message of the inner exception (“Invalid length parameter passed to the SUBSTRING function.”). With this info in hand, I was able to track the issue down to the SQL Server Stored Procedure I wrote to handle queries for events within a given distance of either a latitude/longitude pair, or a zip code (which the data service converts to a lat/long on the fly). Turns out that the issue was poor logic within the stored procedure. Because Community Megaphone supports both in-person and online events, I needed a way to return only those events which were within the given distance (calculated by a user-defined function), which required parsing the latitude and longitude of each event, which are stored as a single column in the db (whether that was wise is a discussion for another day). In the original sproc, I did this by checking whether the value of the State column was either blank or ‘NA’ (as in not applicable). This worked fine for a very long time, but apparently subsequent to writing the sproc, I must have made a modification to some other code that allowed events to be added with a value other than blank or ‘NA’, and as a result, there was an online event which appeared to the sproc to be an in-person event. And when it tried to parse the non-existent lat/long value, it threw the exception above. Fixing the data error was easy enough once I knew the cause, but that would only fix the problem for that one event. Fixing the sproc was pretty simple, too. Since the data that I’m parsing is the latlong column, then I just needed to make sure that there was a value in that column before trying to parse it. In .NET code, you’d simply call String.IsNullOrEmpty(stringval), but T-SQL doesn’t have a native IsNullOrEmpty function, so what to do? The above T-SQL, which is part of the query that returns the matching events, will only attempt to parse the latitude and longitude values if they exist. Otherwise, it will return ‘0’ for the values. The error message I was receiving didn’t mention either LEFT or RIGHT, but rather SUBSTRING. That made it a little trickier to figure out what was going on, but thankfully, the sproc was only 32 lines long, so it wasn’t hard to suss out where the problem was. This is an excellent argument, IMO, for keeping your sprocs small and tight, and moving any logic that isn’t specific to the sproc itself into user-defined functions or other appropriate locations. As with methods in your classes, the fewer responsibilities a sproc has, the easier it’ll be to troubleshoot when it breaks. One thing I did not take advantage of in my stored procedure code (since remedied) is SQL Server’s support for TRY/CATCH blocks. By handling potential exceptions closest to their source, I can make my stored procedure (and hence my data service) more robust, and make it easier to determine what’s going on. I simply wrap the potentially problematic code with a BEGIN TRY / END TRY construct, and follow it up with a BEGIN CATCH / END CATCH. Inside the catch block, I can return my own custom error message, log the error, or handle it however I choose. In the case of this specific sproc, an exception will result in the service not returning any data, but that’s OK, as it will at least return, rather than hanging the ajax call. Keep in mind that by default, WCF Data Services does not return detailed exception information. This is a good thing, until you need to troubleshoot an exception…then you’ll want to remember config.UseVerboseErrors and IncludeExceptionDetailInFaults. WCF Data Services exceptions will not be caught by ASP.NET’s Custom Error feature even if it’s enabled. As such, if you’re counting on Custom Errors to catch any problems you have in your code that don’t have specific exception handling written, you’ll be disappointed here. Make sure that your stored procedures (if used) and your data services code both have adequate exception handling in place, so that your service doesn’t fail completely when an exception arises. Avoid inferring the existence of one column or value based on the value of another column…this was the root error on my part that led to my service crashing in the first place. While more robust exception handling would’ve mitigated the impact of the bug, testing for the value of the column I was actually trying to parse would’ve avoided the whole problem. And a general tip for fellow speakers…ALWAYS check your demos BEFORE you get to the venue. Finding out about this problem even just a few hours earlier would likely have allowed me to fix it, rather than hack around it. I’ve been doing this long enough that I should know better, but clearly I needed a pointed reminder for why you don’t just assume that your demos that worked last week still work this week. Hope you found this useful…if you did, please share this post with your friends!